Sunday’s ceremonies marking the end of the 13-year NATO mission in Afghanistan rightly honored the successes and sacrifices of American and allied troops, who rescued an Al Qaeda and Taliban-led failed state where teenage girls were routinely executed for the “crime” of learning how to read. But the real opportunity that the occupation provided – the one tragically missed – was the chance to wipe Afghanistan off the map. Why? Because just as the Soviet disintegration conclusively ended the Cold War, breaking up Afghanistan will end its war as well. “Afghan” is a Pushtun word. It means “Pushtun.” The 19th Century British, for reasons that made sense at the time, created Afghanistan as a Pushtun empire. It remains so to this day. But today, Pushtuns are just 42% of the population. Tajiks are fewer still: just 27%. But they’re the second largest group, and provided nearly all of the Mujahaddin fighters who fought and drove out the Soviets. By contrast, the Taliban is Pushtun. Most of the Pushtuns live near Pakistan, and indeed, most of the world’s Pushtuns live in Pakistan, where they are the second largest group. 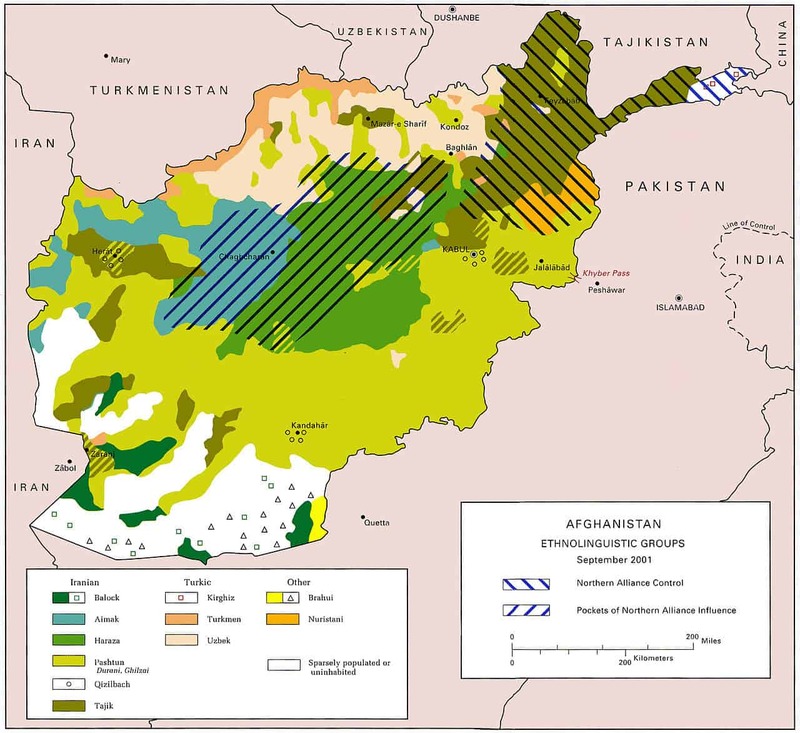 On a demographic map, the Afghan-Pak border runs right down the middle of their territory. The Tajiks, by contrast, are grouped in the north, along the border of (you guessed it) Tajikstan. On both sides of that border, the Tajiks speak the same dialect, share the same (much more moderate) Sunni faith, and harken back to the same glorious history, as descendants of the great Somanid Empire. There is a Tajik cultural revival afoot, led by Tajikstan’s long-reigning president Emomalii Rahmon. He and his followers, on both sides of the border, loathe Al Qaeda and the Taliban. Americans tend to think of the struggle in Afghanistan as primarily Taliban vs. some other, usually unnamed political group, or as Al Qaeda vs. America. This is not the case. The real struggle in Afghanistan is Pushtuns seeking to maintain dominance over everyone else, in a country where tribal differences matter and theirs will always be outnumbered. A partition would, or at least would have, changed everything. Adding Afghanistan’s Tajiks to Tajikistan would double that country’s population, increase the Tajik population there by over 130%, and give the poorest country in Central Asia a share of Afghanistan’s (alleged) trillion dollars of mineral wealth. Both sides of the current border would rejoice, and the primary reason for a never-ending war would disappear. But why stop there? The Uzbek area has oil and gas. The Turkmen area has virtually nothing, but Turkmen have their pride: cut those countries in also. Give the Hazaras (8%, living in the center of the country) a choice: they’ll most likely join the Tajiks. That just leaves the Pushtuns. However unhappy they might be about the partition, they’d be intrigued by the possibilities arising from joining their brethren in Pakistan, where they’d suddenly be 40 million strong (22%) vs. 77 million Punjabis (42%), and have a real say in a sort-of-real country. Not that Pakistan is all that real either. It may be the single worst mistake the British ever made: economically unviable, almost necessarily in permanent conflict with India and now nuclear armed. But adding the Afghan Pushtuns helps everyone more than it hurts. First, it keeps Pakistan inwardly focused for a very long time, on a problem it already has anyway. Second, it gives Pakistan sufficient mineral wealth to become economically viable for the first time in its history, resulting in significant economic development in an area whose people would otherwise join the Taliban for lack of anything better to do. And third, as Wheeler points out, it would force one of two choices on Islamabad: end the Punjabi empire and genuinely democratize, or call in the Chinese to help develop its new lands and “handle” security. Either way, Pakistan wins, India wins, all the other Afghan groups win, all of Afghanistan’s neighbors win. Legitimate Pushtun leaders are strengthened, and the very existence of the Pak state (and Chinese profits) suddenly requires the ruthless annihilation of the Taliban, without a dollar spent or a drop of American blood shed. Alas, our leaders in both parties missed this grand opportunity. If thirteen years of war taught us anything, it’s that Afghanistan is a blob on a map to whom absolutely no one is loyal. And setting right that 19th century mistake would have made all our blood and treasure spent vastly more worthwhile.